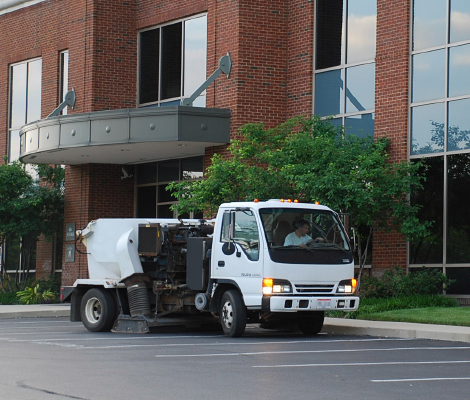 Columbus Power Cleaning offers high quality sweeping services to clients throughout Ohio. We have the right equipment for any job including specialty equipment such as mechanical broom trucks for heavy debris and low profile vacuum trucks for parking garages. We also provide incidental services like blowing off sidewalks, emptying trash receptacles and cleaning green areas by hand to offer our clients a true full-service experience. A clean parking lot enhances a property’s beauty and presents an image of success. Extend the life of your parking lot or roadway. Sand, dirt and debris are abrasive on pavement, if not removed they shorten the life of seal coating, striping and the pavement itself. A regular sweeping program reduces the pollutants that filter into local waterways through storm water run-off. Trash and debris can cause slip-and-fall accidents as well as flat tires and other property damage. Some local municipalities issue citations for litter and debris that is not removed. People are less likely to litter and illegally dump on properties that are clean. Our fully-insured, licensed professionals have the experience to handle any job. Our customer service is second to none, and we always stand behind our work. We match each client with an Account Manager, a single point of contact to simplify the experience and ensure excellent service. We also offer secure online access to download insurance certificates and invoices, make payments, request estimates, and submit work orders.